Patients and their families at Torbay Hospital’s Ricky Grant Day Unit and its closely associated ward, Turner Ward, have been gifted two new day-bed chairs from our staff at Cavanna Homes. The day-bed chairs transform into overnight beds providing a more comfortable stay for patients’ families when staying on the ward, while their loved ones are receiving Systemic Anti-Cancer Therapy and, for some, end of life care. In addition to the two day-beds, we have also donated a cheque for £5,372 which will be used to purchase an AccuVein AV400 for the Day Unit which is a handheld, non-contact vein illumination device. The AccuVein will aid in identifying patent veins and finding valves resulting in less patient discomfort. Sara McMurray, Turner Ward Manager, said: “Previously when family members stayed on Turner Ward overnight, they were provided with a mattress and normal chairs to sleep in, which we appreciate is not very comfortable. “This incredibly generous donation of two day-beds from Cavanna Homes is going to make a huge difference to visiting families, allowing them a comfortable place to rest while staying with their loved ones”. Ruth Allison, at the Ricky Grant Day Unit, said: “We rely heavily on the kind donations from people and local businesses to provide additional extras on the Day Unit. The Ricky Grant Day Unit is a haematology / oncology day centre providing chemotherapy and other associated treatments, plus education and advice on an outpatient basis, based at Torbay Hospital. The Unit works in close association with the Turner Ward, the acute ward for haematology and oncology. People will instantly recognise our logo with our iconic seahorse, but not everyone knows the seahorse is called Trigger. Throughout the year, whenever our staff have taken a holiday, we have taken a seahorse soft toy Trigger with us. 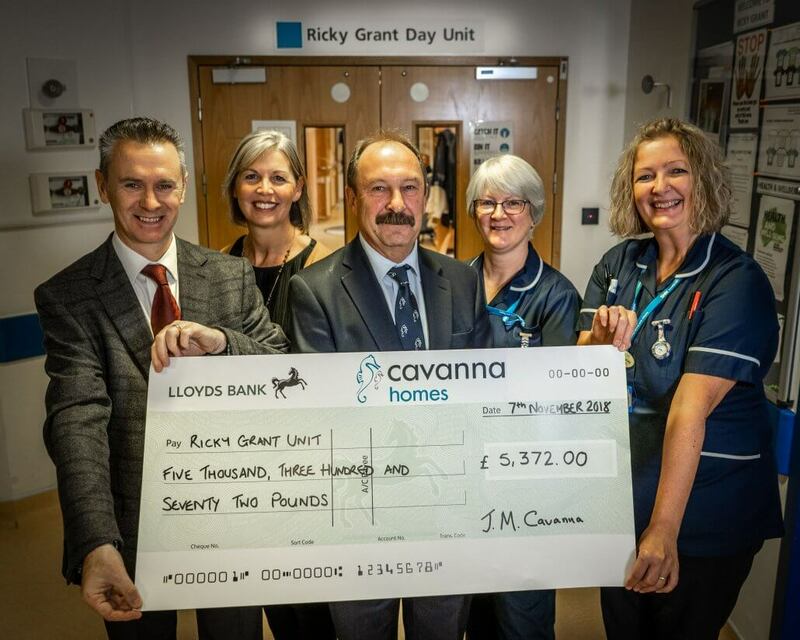 Based on the number of miles racked up on “Trigger’s Travels”, the firm has also donated £5,372 which was presented to the Ricky Grant Day Unit. 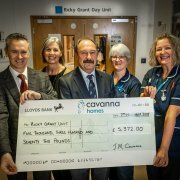 Martin Cavanna said: “The Ricky Grant Day Unit is very close to our hearts, as one of our staff members is undergoing treatment there, so we wanted to support the brilliant work of the Unit. “When we heard that the was looking for two new day-bed chairs, we were more than happy to help, and through our ‘Trigger’s Travel’ fundraising campaign we have raised a further £5,000. “The patients’ care is fully-funded on our NHS service, and with so few people unaffected by cancer, we wanted to do our part in making the process a better experience for family members of patients. We hope our donations will make a real difference to the Unit and all those receiving treatment there”.